We are back for our traditional party at the end of the exams and just before the summer, Kozzmozz, on the last Saturday of June! We are keeping our recent tradition of combining the old with the new ... in techno terms that means ... Detroit with Berlin. This edition will show the various shades of what techno has to offer today, from the deep and soulful to the dark and stripped. 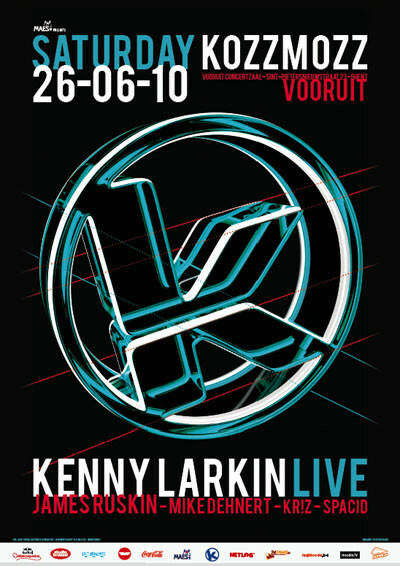 For Detroit we hail Kenny Larkin who since 1990 has cemented his name in the pages of dance music history along with fellow Detroit Techno music mates, Derrick May, Carl Craig and Kevin Saunderson. After a short break from music to pursue his stand-up comedy career, he came back with a vengeance. First with an album for Carl Craig’s Planet E called ‘Keys, Strings and Tambourines’ in 2008, later with a double compilation for Rush Hour called ‘The Chronicles’ which contains remastered versions of some of his finest past releases. Last year he remixed Ben Klock’s ‘Ok’ featuring Elif Biçer. The remix made it to many top remix lists of 2009. On top of that he has been commissioned to remix seven projects from various high profile artists, including Plastikman and Radioslave and has just released the Glob ep including a Ben Klock remix on Planet E. After the launch of his live-set at Fabric, Kenny will also be performing live on the Detroit Music Festival and then Kozzmozz! Another pioneering name in our line-up is James Ruskin who is one of UK techno’s most prominent names. He recently relaunched his Blueprint imprint and featured on Resident Advisor as label of the month. We quote: “In 14 years of operation, Blueprint has had a grand total of 29 official 12-inches. A few limited edition EPs, a small sub-label have added to the pile, but here we are in 2010. Still awaiting BP030. It won’t be long, Ruskin assures us. In 2009, the London-based DJ/producer relaunched the imprint after a short hiatus. Since then, Blueprint has been releasing work at a breakneck pace. Four whole 12-inches in 12 months. Perhaps most surprising of all, the output came from names—O/V/R, Valmay, Mark Broom—never associated with Blueprint before.” Some hot upcoming releases are remixes for Planetary Assault Systems on Mote Evolver and for Robert Hood on M-Plant and a brand new ep on Ostgut Ton. From Berlin comes Mike Dehnert, resident Tresor dj and one of the strong upcoming talents in the today’s techno scene. He started releasing under several monikers such as MuMu and Dj Larsics, but after he founded his own label Fachwerk he started to release under his own name. His productions perfectly combine the soulfulness of Detroit with the dark warehouse feel of Berghain techno. His releases on Fachwerk and Clone got euphoric responses and reached massive support by many “big” artists. Shortly after he was invited to organize a Fachwerk label night at the best techno club of the world, the Berghain Berlin. It was only a question of time before he got booked to play at Kozzmozz! Spacid, who we already know well from his great sets at Ultra and Retro Acid, will return for a second appearance in the main room of Kozzmozz. With 20 years of dj-experience in electronic music, we can expect a deep techno set that will blow the roof off. Resident Kr!z is going stronger and stronger with his label Token Records. Kr!z has taken Token on the road with label nights in Shangai, London, Berlin, Rotterdam, … He has released 11 records in less than two years from artists such as Inigo Kennedy, Phase, Radial, Dimitri Andreas, Oscar Mulero and more. As usual he will close the night off with a bang!